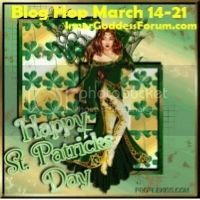 this great St. Patrick's Day hop !!! St. Patrick's Day always reminds me of green beer, which i never drank, and where I lived growing up, they used to color the river green. I'll be giving away a green(filled) goodie bag :) So make sure you leave a comment and your email ! I'm also going to share an excerpt from Harper's Wish when they were kissing. Who doesn't love the kissing parts? “Holy crap you scared me. I was just shutting the door when you knocked.” She stood back as Fin walked into the room and toward her. With a hand over her heart, she tried to catch her breath. “Dang, I’m sorry.” His warm palms rested where her arms were bare from the short sleeves. His presence took away the chill she had but it created a whole different set of emotions instead. He was close enough she could breathe in the scent of the aftershave he’d used and the ends of his hair, the color of burnished oak, were still damp. A vivid mental picture of him naked in the shower had her heart racing again. As she looked toward his handsome face, his eyes darkened, as if she were his next meal. The control no longer her own when her gaze traveled toward his lips, lush and begging to be kissed. The magnetic energy evident between them had her body being drawn toward Fin’s bare chest where her hands instinctively landed only seconds before his lips crushed onto hers. The nerves all over her body ignited and she returned his advances wholeheartedly. His hands roamed over her back and lower while she twisted her fingers over his muscles and into his hair. Neither could fight the attraction a second longer as his fingers fisted into his own t-shirt she wore, edging it higher to reveal her silky skin. Don't forget to hop along with us all !! !